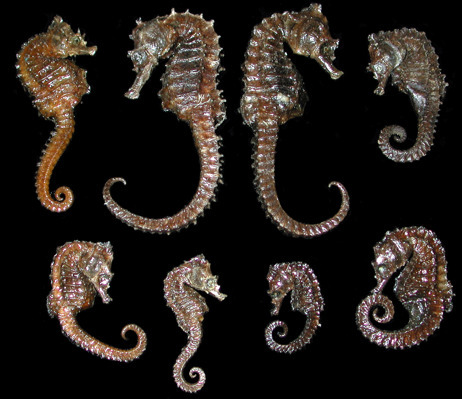 Seahorses belong to the genus Hippocampus, which, in turn, belongs to the family Syngnathidae. Syngnathidae include pipefish and leafy sea dragons. There are over 47 species. These are mainly found in shallow tropical and temperate waters throughout the world. They prefer to live in sheltered areas such as sea grass beds, coral reefs, or mangroves. Colonies have been found in European waters along the Thames Estuary. They range from North America down to South America. In the Americas approximately 4 species exist. These range from very small (dwarfs of about 2.5 cm / 1" long)to a much larger variety found off the Pacific Coast of Central America(the foot-long Hippocampus ingens). Hippocampus erectus are larger ranging from Nova Scotia down to Uruguay. The Mediterranean Sea has three species: Hippocampus hippocampus (long snout), Hippocampus brevirostris (short snout) and Hippocampus fuscus(immigrated from the Red Sea). These species form territories. The males stay within about one square meter of their habitat; females range out, about one hundred times that area. They bob around in sea grass meadows, mangrove stands, and coral reefs where they are camouflaged by murky brown and grey patterns that blend into the sea grass backgrounds. During social moments or in unusual surroundings, they tendto turn bright colors. The species we are offering are farm raised. Seahorse populations have become protected in many places. However, the demand for these creature has not diminished. This has spawned the seahorse farm industry. There are several such farms in the Indonesian region; where our specimens are raised. The picture provides a good example of our seahorses. Keep in mind the larger the species, the less curl in their tail. I suspect the farmers have done this to make sure they get the most of the measurements. The larger the specimen the more costly they are.